Part 8: I know how much I want, but how do I go about getting it week to week? Next up: What is the biggest risk I face in retirement? 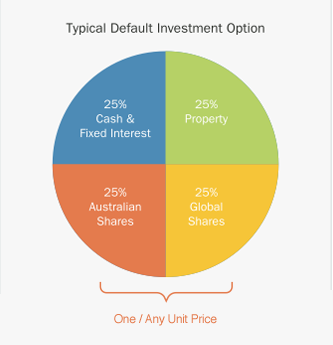 25% of your money in cash and fixed interest, 25% into Property, 25% into global shares and 25% into Australian shares. 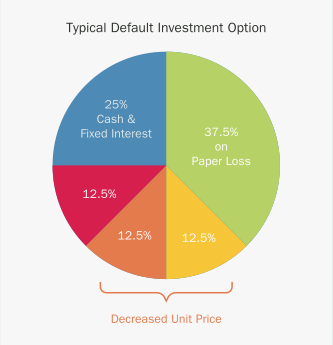 The underlying price of these assets is combined into one single price called a UNIT PRICE. You would have seen this on your superannuation statement before: You currently have 10,000 units in the Balanced fund and the current unit price is 12.50 therefore, your balance is $125,000. Over time as the value of the shares and properties go up and down the value of the unit price changes accordingly. When you put money into your super fund, you buy more units at the price on that day. Now consider a scenario similar to the Global Financial Crisis when Share Markets and Global Property markets fell by around 50%. Now, what if you made this loss real in dollar terms? If you start withdrawing money from your super at retirement, you are now selling your units at a loss! As you can see, the value of your cash and term deposits have remained unchanged. However, the values of your shares and properties have significantly reduced. Given all your assets have ONE combined unit price; the entire value of your superannuation would have reduced on paper.